It's PARTY time! Utah Shop Hop 2018 is only days away and YOU'RE INVITED!!! It’s almost time for the PARTY to begin! Utah Shop Hop 2018 is only days away. Consider this your invitation! Do you have your passport yet? They are available now at any of the participating shops. We advise that you buy them early to avoid long lines during the Shop Hop. Your $5 passport comes with a party lanyard and is your ticket to receive an exclusive free pattern & unique button at each shop. Get your passport stamped at all 14 participating shops along the Wasatch Front to enter to win sewing prizes worth partying about! 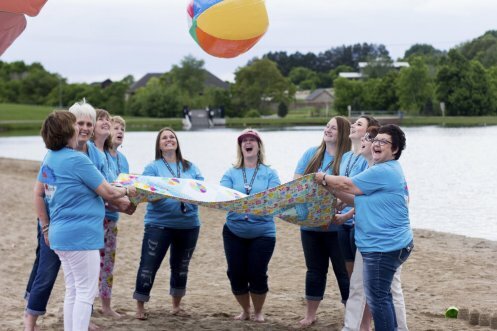 Here at Corn Wagon Quilt Co. We’re having a BEACH PARTY! Grab your bikini, flip-flops and beach towel (don’t forget the sunscreen!) and stop in to see what fun beach inspired projects we have in store. We’ve been collecting beach themed fabrics and ideas for weeks now and can’t wait to share them with you! As always there will be treats, a chance to win prizes and lots of fun with quilt-loving friends. Aptly named, Hale Makai (ha-lay ma-kai) in Hawaiian it means “Ocean House” and these little surf shacks look to be a short walk from the beach. Perfect! Chris Chamberlain discovered this pattern by Robin C. Nelson and knew it needed to be a part of the Beach Party. 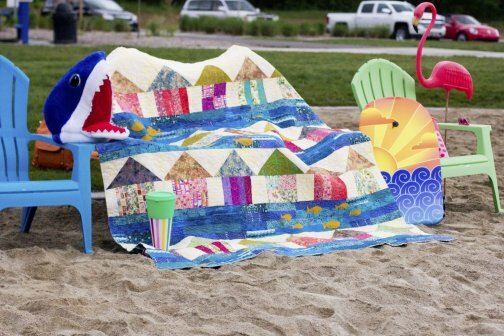 It's just one of several new beach inspired projects you will find during Shop Hop including quilts inspired by the colors of the sand and sea, playful beach ball quilts, even a must-have beach bag! All ages and skill levels welcome! Kids, that means you too! 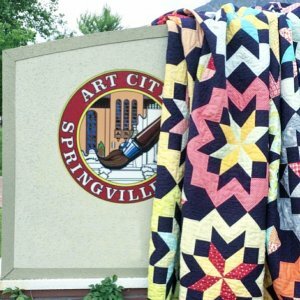 Quilts will be on display June 8-9 at the Community Services Center just east of the Art Museum. Let's show this city what our quilter's community is made of! Corn Wagon Quilt Co. will be CLOSED Monday, May 28th in observance of Memorial Day. Since we will be closed for Marvelous Monday let's have a Terrific Tuesday! Tuesday, May 29th, enjoy 25% off all regular price Minky & Cuddle cut yardage & Cuddle kits! Utah Shop Hop 2018 - "It's a Party!" See special Corn Wagon hours above. Visit utahshophop.com for more details on participating shops, a map and list of prizes!